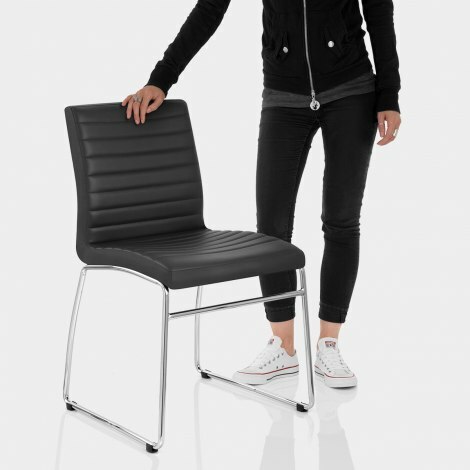 The Panache Dining Chair Black is shaped for optimal comfort, with an ergonomic design. Perfect in a home dining room or in a kitchen at a breakfast table, the Panache makes a success of its clean and simple design. The seat is covered in black faux leather, with the front of the chair curving inwards to accommodate your legs and help make the Panache even more relaxing. 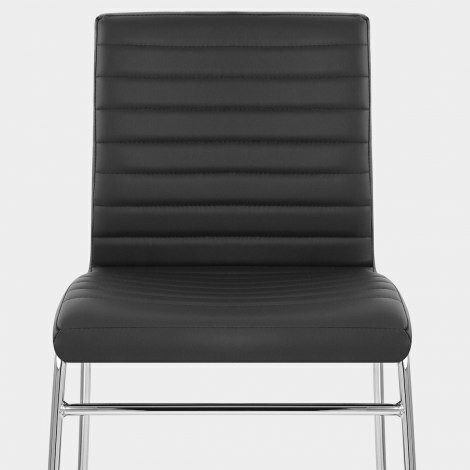 Plus, the high backrest is contoured to your back for exceptional support and for superb posture. An elegant chrome tubular frame keeps the chair stable thanks to its strong welded design and it has rubber stoppers to protect your floor. "Chairs are comfortable & look lovely"
We've been looking for new chairs for some time now and whan we saw these we new they would be the right choice. Very comfortable and warm to sit on with great support. The quality is excellent and easy to assemble the seat /back to the chrome base plus, they slide easily in our original 60's parquet floor. Very pleased we found them. Beautiful chairs, well made and very attractive. Complement my living room very well. Thanks Atlantic Shopping. I bought these chairs as my Dad was having trouble moving the old ones away from the table and I just got one to see if it would slide easier. I removed the pads off the bottom and it worked fine. We then realised that they were also very comfy, look smart in the room, and so we invested in another three to replace their other chairs as well. Great value and very comfortable for the price. Delivery was quick.